We are proud to have the accomplished luthier CAT FOX helping out with repairs. Please read about Cat in the About section of the website. Crack Repair: $30.00 per inch by quote. Includes glue and cleat repair. Please note: prices are estimates only, due to the individual nature of each job, estimates may vary. If costs exceed the estimate the customer will be contacted before the work is done. Prices are quoted for labor only. All parts and strings are additional. 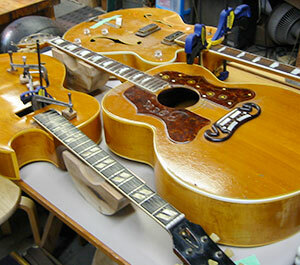 All guitar repair work is guaranteed for a period of 90 days unless otherwise specified. Adam quickly sized up the problems and breathed life back into both of my guitars. After brief stays in his shop they both play like butter again. I couldn't be more pleased …and at Adam's gentle but firm suggestion, I am totally keeping an eye on the humidity! You transformed this guitar. It had wonderful tone to start and that hasn't changed, but the playability is waaaay better than it was. Perfect set up. All the way up and down the neck. I have never had a guitar that was set up this low and still handled a capo and hard strumming with out buzzing all over the place. I have not checked the intonation but with the lower action I am sure it has improved as well. Wonderful work Adam. Adam took in my prized 1994 Flatiron Artist mandolin for badly needed fretwork. When returned, it played like a dream and the intonation was perfect. Adam listened patiently to my concerns, did the work promptly and for a reasonable price. He even buffed the hardware and touched up the finish. He's a real pro! Having Adam and Circle Strings in town fills a hole in the local market for high end acoustic instrument repair. You can feel comfortable and confident taking any instrument knowing he will give it the attention that it deserves. ..there is something special about a perfectly set up guitar.. It's nice to know there is a world class luthier right in Burlington! As a working musician who is usually touring or in the studio, I need to be able to trust that my instruments are in the best working order. Thanks to Adam, I can.